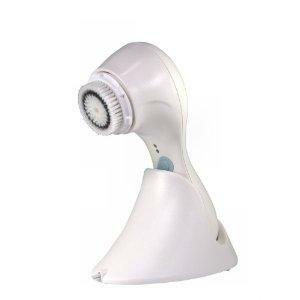 The Clarisonic face brush has received plenty of recognition within the beauty and skincare industry. Are you curious what the buzz is all about? Whether you're considering the purchase of the Clarisonic to treat problem skin or just want to ensure a deep down clean, here's a look at everything you need to know before making the Clarisonic splurge. Using the Clarisonic brush is simple. The sonic micro-massage action is turned on by a switch and the brush goes to work rotating 300 movements per second to cleanse and remove hidden dirt, oil and makeup residue. The Clarisonic automatically turns itself off after 60 seconds, making the usage fool-proof and convenient. While the Clarisonic has its own line of skincare products created for use specifically with the Clarisonic brushes, nearly any facial cleanser will do. Bear in mind a foaming cleanser will work better with the oscillation system than a non-foaming product. Please note oil cleansers should not be used with any of the Clarisonic brush systems. The Clarisonic brush is available in a limited edition Clarisonic PLUS, the original Clarisonic Plus, the Clarisonic Classic, and the Clarisonic Mia. The Mia is just as effective as the full-size Clarisonic brushes, making it the perfect trial sized option for those seeking a more affordable entry-level system. While prices between models are subject to vary, you can expect to invest a couple hundred dollars for a basic Clarisonic system. While the results and benefits of the Clarisonic face brush vary on an individual basis, most users find their skin has a healthier glow immediately upon first use. Over time, pores may become visibly diminished, while minor skin imperfections may also be eliminated. Since the Clarisonic face brush is a high ticket skincare tool, it's best to purchase the unit from a retailer that carries a liberal return policy, should the results deem the brush ineffective for your needs. The following retailers sell the Clarisonic brush and offer a return policy covering your full purchase price if you're dissatisfied with the Clarisonic for any reason within the first 30 days.